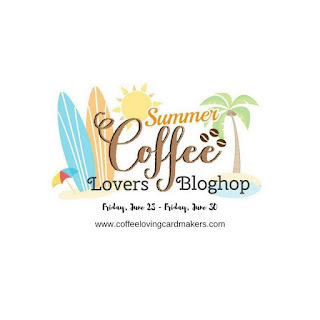 and also made with the Coffee Lovers Blog Hop in mind. I think the sentiment fits the occasion. I started with the dp, but decided that gray on white with embossed gold dots was a bit blah, so coloured the roses with chalks, and liked the results at the time. The sentiment was initially stamped onto the dp, but it warped and did not emboss well, so plan B - put it onto plain white card, die cut it and sponge the edges with gold Delicata ink. I also stamped and embossed the coffee mugs as I went, and coloured them with prismacolor pencils before fussy cutting them. I laid out the card, was happy how things looked, so wound the bakers twine around the dp, and adhered it to the base, having previously gold embossed the edges of it. Then I discovered another BIG OOOPS - I had adhered it upside down, so that meant a quick rearrangement of the elements before adhering them over fun foam. Some gold sequins in the centre of the flowers on the cups and on the sentiment panel and the card was done - finally 😏, by then I was having second thoughts about the flowers being coloured, but I was not going to start again! I finished the inside with a strip of the dp (uncoloured) and a gold bordered ribbon. At the last class I ran, for one of the projects I challenged those present to make a card using a recipe that I provided - my assumption that they would find this easy was not correct!! It was a real challenge to those present, but what they created was amazing. I selected this stamp from the Our Daily Bread Designs - Grace's Hope Set - I stamped it in Memento Rhubarb Stalk ink , and sponged it with Whisper Rich Plum ink after die cutting and embossing it, before removing the die. The paper came from a collection I have had for years - I cut it into banner shapes and sponged the edges of it with the Rich Plum ink and also the Sugarloaf Green from Whisper inks, and added matching ribbon and rhinestones. I also sponged the edge of the doily with the Sugarloaf Green ink. The butterflies were cut with Memory Box dies from pink glitter card, and had clear rhinestones adhered to them, that matched the rhinestones on the corner and top of the banner. I decorated the inside using some paper lace tape that I sponged with the Sugar Loaf green ink. I was in the studio and I had a few spare minutes, so I took a gray card base and glued the strips of trimmed paper to it - shh, I left the centre of the base empty (all in the name of thrift, of course)!! I stamped the centre panel with a NBUS Sweet 'N' Sassy stamp, and discovered that the ink pad that I was using 'collapsed' - it was a sponge pad as I was using pigment ink, but it just went flat - most annoying as it was nice and juicy still . and another strip of offcut on the inside and called it done! This is another of 'those cards' that just did not do what I wanted it to do... so here it is in it's final, very modified state! I started by smooshing alcohol inks "a la Loll" and ended up with a nice sheet of colour - tried heat embossing it on a scrap - it worked, but what I really wanted to emboss did not work at all!! The sentiment was gold embossed on vellum, and layered over some more of the background layer, before adding gold sequins to finish the card. Thank you for taking the time to visit my blog, may your day be blessed. This card came together in relatively quick time, although it is nothing like what I had intended to make!! but that's o.k. as I am happy with the end result. Wash, a silver shimmer spray and Wild Berries Smooch Spritz. This gave an amazing, shimmery background, over which I glued two layers of the hexagon border die cut from Frantic Stamper, cut from a scrap of light mauve card, and sprayed with just the silver shimmer mist. I then stamped and silver embossed the rose, (on a wee cut-off) painted that with mica based water colour paint - just a cheap set that is un-named, and fussy cut it before gluing it over the border die cuts.! The finishing detail was to silver emboss the sentiment on a mid purple card, which I cut to a banner shape, and mounted it over a dark purple layer. This card was made for a family member who's birthday I really did not forget, but it occurred right at the time we were busy with the funeral and such things... I think she may excuse it's late arrival. I started with a card from a Prima Journaling pad, trimming off the top corners to make a tag. I mounted it offset onto a small piece of dark card, and sponged the other edges with ink. Before it was layered onto the base I stapled two pieces of organza ribbon onto it. I computer generated and printed the start of the sentiment onto a pale green vellum and gold embossed it, and attached to to the base with vellum tape. The balance of the sentiment I printed inside the card. The finishing touches were the green rhinestones. The last few days I have found very hard, so please excuse me if I have not visited you recently. I would like to introduce to you my new companion - Tinker. So named as he is a really mischievous young fellow - about 5 months old. Quite timid as yet, he is a rescue kitten who has not been well socialised, but very vocal. He was constantly 'talking' as I took the photos!! In addition to that, I have recently made a birthday card for another cat lover in the family. The cat image is an old Hero Arts one. I stamped in black and clear embossed the image, masked it and a background area, and then sprayed the background with a chalk ink. Before removing the masks, I also stencilled a background using a Stamplorations Confetti Circles Stencil and Delicata Golden Glitz ink. The floor boards were drawn using a fine micron pen, and the image and floor coloured with chalks, and the bow with a glitter pen. The sentiment was white embossed on black card, and trimmed out to form a banner. After much plotting and secrecy, the recipient has (literally) just been surprised with a grey and white (sort of tabby) cat for their birthday.!! It is a very special breed, La Perm, that does not cause an allergic reaction for one of the family members.